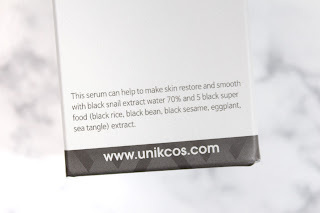 Today's review is on the Unik Black Snail Restore Serum that I received complimentary from Unique4U.net or Blueprint21 on eBay here. I know that some of you out there are opposed to the idea of putting snail mucin on your face and I understand why. However, snail mucin is one of my favorite ingredients and here's why. First, helix aspersa muller glucoconjugates (the technical name for snail goo) moisturizes, reduces redness and inflammation plus it calms and soothe irritated skin and helps promote healing. The use of snail mucin goes back to ancient Greece when poeple would use the goo on wounds and burns because of it's healing, soothing and repairing properties. Additionally, snail mucin has shown to reduce acne, minimize post acne scars and discoloring. Although there isn't sufficient evidence in research, snail goo is said to also be effective at boosting collagen and elastin production. So, as you can see why I love this ingredient so much! This serum is called a "restore serum" and claims to strengthen the skin and restore the skin's natural barrier. This is also said to provide the skin with nutrition while calming and soothing. This also claims to smooth out the skin's texture and helps to even out skin tone. I always like to start my reviews by stating my skin type and conditions at the time of the review. If you follow me on Instagram, you will know that my skin is quite sensitive and I am currently battling perioral dermatitis. I am also acne prone however, with the incorporation of treatments like Differin seen here, my skin seems to be less prone to breakouts but more easily dehydrated and flaky. My review will reflect how these products work for my personal skin type and condition and as a disclaimer, your results may vary. Every product I use goes through a very detailed patch testing period. I always patch test and I recommend patch testing to everyone. Although there is an argument out there that patch testing doesn't actually work seen here on The Beauty Brains, patch testing has saved my skin from some pretty serious negative reactions. Although I do agree with TBB (and love this pod cast btw) that patch testing does not work against evaluating whether a certain product will cause breakout however, patch testing will help determine if your skin is allergic to the ingredients and/or the formulation. This type of negative reaction is seen in the form of itching, stinging, intense flushing, burning, rash or hives. I introduce new skin care products to my easily irritated skin by patching testing. Patch testing can look different for everyone but for me, I test products in stages. For this product, I applied the serum to my more sensitive areas like around my neck, chest and behind/in front of my ears. I would apply a product twice within a 24 hour period. If all goes well, I begin to use the product on half of my face and then work up to applying the product all over. Phew, I hope that makes sense. This serum is a clear glass bottle with a dropper applicator. This contains 50ml of product. The formula is actually pretty "clean" with very little fillers on cosDNA here. This does contain lots of roots and extracts so you will want to be sure you have no known allergies to any of the ingredients. What makes this formulation so unique is that it contains 70% black snail extract and 10% centella asiatica leaf water. Snail secretion filtrate aka snail goo might sound gross but it is actually a very beneficial, skin loving ingredient. Snail slime is rich in not only hyaluronic acid but it also contains glycoproteins. Richard L. Gallo M.D., Ph.D., Professor of Medicine and Pediatrics, and Chief of the Division of Dermatology at the University of California, San Diego states "We are learning more everyday about how essential glycoproteins are to help turn back the aging process for the skin. As the body ages, the quantity of glycoproteins in the skin becomes depleted, contributing to loss of turgor and sagging." here. In addition, this contains proteoglycans which is biological polymers whose key role is to hold moisture in the skin, making it extremely effective natural moisturizer. It is also very plumping. Both glycoproteins and proteoglycans help protect the skin from damage and helps restore moisture loss. Centella Asiatica has become one of my favorite ingredients for my sensitive, often red and irritated skin. Centella is a medicinal herb used in ayurvedic, African and traditional Chinese medicine. This unqiue extract can stimulate the regeneration of skin in burn and treating wounds by accelerating the healing process. Centella also promotes collagen product because it's rich in Vitamin A, B1, B2, C and niacin and carotene which help fight premature aging. Centella is also very soothing, calming plus it helps reduce redness. It really does so much hence the reason for my love of this mighty extract. This also contains black beans, black rice, sesame, kelp and eggplant which are all antioxidants that help nourish and protect the skin. So in essence, snail mucin is very anti aging because it has been shown in research studies to stimulate collagen and elastic products, it helps to repair and heal damaged skin and is very soothing and calming. This serum is a slightly watery gel that is not sticky and absorbs into the skin, leaving no residue or tacky feeling. This contains no fragrance which I love plus the ingredients are pretty damn good. I use a full dropper and that is enough for my face and ears. I then use about half a dropper to use on my neck and upper chest. This feels instantly cooling and soothing however, I don't find this as calming/soothing as my HG Snail Essence from Cosrx. As far as restoring the skin, reducing disscoloration, boosting collagen...all of those results would take weeks and perhaps months to show physical effects to the skin. I will say that this is soothing, calming and does help reduce irriatation and redness quite well, especially on and around my dermatitis. I do love the ingredients/formulation but it just doesn't provide the same level of efficacy that I get from the Cosrx. On the plus side, this is less expensive than the Cosrx and would be a great introduction into using a snail mucin product. Overall, I don't think I would repurchase becaue I love the Cosrx product more.